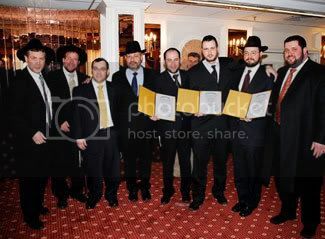 Three newly ordained rabbis from Germany, holding certificates, who received their training through the Internet. BERLIN (JTA) — Germany has three new rabbis thanks to a virtual yeshiva. Benzion Dov Kaplan, Donnell Reed and Yitzhak Mendel Wagner received their ordination Jan. 2 from the Jerusalem-based Shulchan Aruch Learning Program of Pirchei Shoshanim. The Orthodox smicha ceremony, which also included several other candidates, took place at the Western Wall in Jerusalem. But since Kaplan, Reed and Wagner couldn’t leave Germany to study in Israel, the program enabled them to complete their training via Skype, the Internet telephone service, and other Internet sites, Reed said. Reed, 41, an American who has lived in Berlin for 18 years, said the program allowed him to study Torah in the morning and evening while continuing to manage his business and spend time with his family. When he had questions, he turned to the Chabad rabbi in Berlin, Yehudah Teichtal. Wagner, 27, from the city of Krefeld, studies Judaism at the University of Dusseldorf. For years he has been involved in local Jewish life, and now will head the community’s adult education programs. Kaplan, 30, came to Germany from Ukraine and works as a rabbinical assistant for the Jewish community of Dusseldorf, which has co-sponsored his studies. Germany has fewer than 30 ordained rabbis, not enough to serve its growing Jewish community. Official membership in the community has quadrupled to about 120,000 with the influx since 1990 of Jews from the former Soviet Union. Unofficially there may be as many as 200,000 Jews in Germany. In the fall, three rabbis were ordained by the Reform Abraham Geiger College in Potsdam, the first rabbinical program to grant ordination in Germany since the Nazis closed down Jewish schools. Teichtal also has seen some of his students become rabbis. Another institution in Berlin, the Orthodox Yeshivas Beis Zion-Lauder College at the Skoblo Synagogue and Education Center, has some 30 male students, some of whom may pursue ordination, according to Rabbi Josh Spinner, vice president of the Ronald S. Lauder Foundation. The yeshiva has an ordination program, supported in part by the Central Council of Jews in Germany, and currently has two of its students enrolled. But the recent ordination in Jerusalem is likely the first that depended largely on Internet telephoning. Few of the candidates had seen each other until they met in Israel, Reed said. According to Reed, the three Germans studied together over Skype and Virtual Yeshiva several times a week for two-and-a-half years. They plan to continue their Internet studies together, and are hoping to find Russian-speaking men in Germany to join them. Though it may seem somewhat unorthodox to learn over the Internet, Reed said several noted rabbis have endorsed the idea. Israel’s Ashkenazi chief rabbi, Yona Metzger, once told him that since Jews are urged to learn “while you sit in your home and while you walk on the way,” they ought to take advantage of modern technology to do so, Reed said.